The book of Joshua details the fulfillment of the Land Promise God made to Israel (Josh. 21:43,45). The book consists of twenty-four chapters, and divides exactly in half regarding subject matter. The first twelve chapters record the conquest of Canaan, and the last twelve record the division of the land to each of the tribes of Israel. Josh 14-15 deal with the inheritance of Judah. It is within that context that the inheritance of Caleb is discussed. Caleb and Joshua were the only two of the 603,550 men of war who were faithful to the Lord and stood their ground at Kadesh-Barnea (Num. 13). All of those men died in the wilderness because of their refusal to take possession of the land (Num. 14ff), except Joshua and Caleb. That was the period of 40 years of wandering in the wilderness of Sinai. That period passed. At the point where Josh. 14 takes up is 45+ years later; now Caleb is age 85 (v.10). Israel had control of the land, but there was still much to be conquered and possessed. 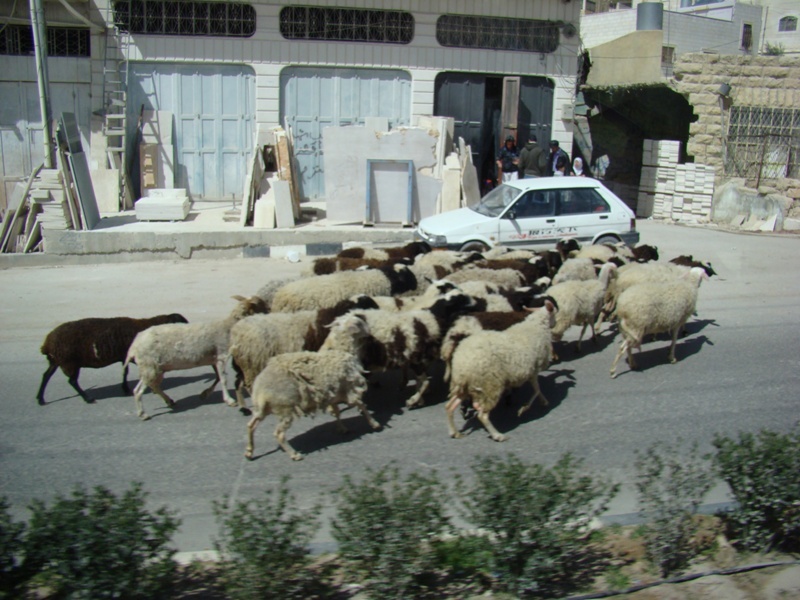 Sheep in street in Hebron. Photo by Leon Mauldin. And Caleb the son of Jephunneh the Kenizzite said to him, “You know what the LORD said to Moses the man of God in Kadesh-barnea concerning you and me. 7 I was forty years old when Moses the servant of the LORD sent me from Kadesh-barnea to spy out the land, and I brought him word again as it was in my heart. 8 But my brothers who went up with me made the heart of the people melt; yet I wholly followed the LORD my God. 9 And Moses swore on that day, saying, ‘Surely the land on which your foot has trodden shall be an inheritance for you and your children forever, because you have wholly followed the LORD my God.’ 10 And now, behold, the LORD has kept me alive, just as he said, these forty-five years since the time that the LORD spoke this word to Moses, while Israel walked in the wilderness. And now, behold, I am this day eighty-five years old. 11 I am still as strong today as I was in the day that Moses sent me; my strength now is as my strength was then, for war and for going and coming. 12 So now give me this hill country of which the LORD spoke on that day, for you heard on that day how the Anakim were there, with great fortified cities. It may be that the LORD will be with me, and I shall drive them out just as the LORD said.” 13 Then Joshua blessed him, and he gave Hebron to Caleb the son of Jephunneh for an inheritance (ESV). Caleb’s character. Characterized by wholehearted devotion to God (Josh. 14:8,9,14). Forty-five years earlier during the crisis at Kadesh-Barnea (Num. 13-14), Caleb discerned what was right and was faithful to it. He did not swerve from this principle. He was basing his request on the promise of God (v.9). Perhaps one of the greatest lessons is to notice what Caleb was asking for. There were still giants in the land (Anakim, v.12). There were still fortified cities. Caleb was not asking that land already conquered be given to him. He was asking for the opportunity to fight, to seek to defeat and drive out the Canaanite inhabitants, that the territory of Hebron would thus be his inheritance. At age 85, Caleb was not asking for an easy inheritance, but one full of danger. Yet he looked upon it as an opportunity. His source of strength in battle was the Lord. His victory was predicated upon the Lord’s being with him (v.12). 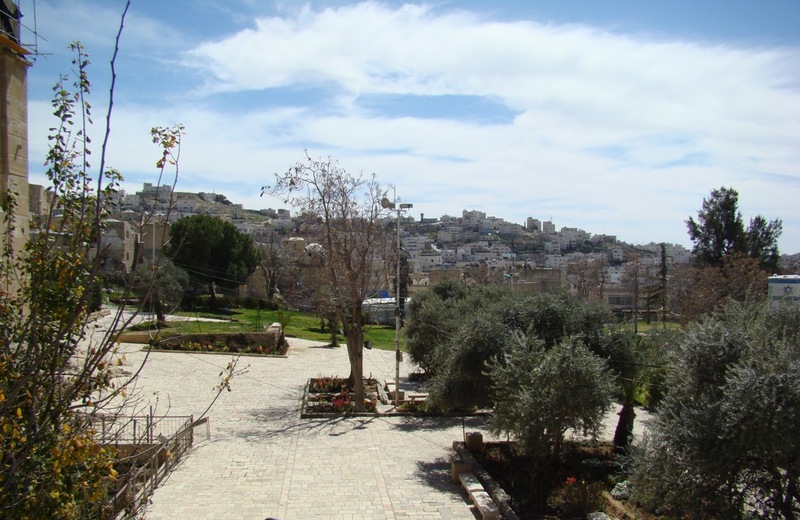 Our photo here shows a view of modern Hebron as we look out from the cave of Machpelah. Hebron as seen from cave of Machpelah. Photo by Leon Mauldin. Therefore Hebron became the inheritance of Caleb the son of Jephunneh the Kenizzite to this day, because he wholly followed the LORD, the God of Israel. 15 Now the name of Hebron formerly was Kiriath-arba. (Arba was the greatest man among the Anakim.) And the land had rest from war (Josh. 14:14-15, ESV). Remember to click on images for larger view. This entry was posted on Tuesday, May 17th, 2011 at 9:04 AM and is filed under Bible History and Geography, Bible Study, Israel, Old Testament, Travel, Uncategorized. You can follow any responses to this entry through the RSS 2.0 feed. You can leave a response, or trackback from your own site.